Groundwater Conservation Districts (GCD) within a designated Groundwater Management Area (GMA) are required to work together to develop and adopt Desired Future Conditions (DFCs) for the aquifers within their territorial jurisdiction. The following page outlines the process that the GCDs must follow in developing and adopting the DFCs. Environmental Stewardship’s Executive Director, Steve Box, attended the twelve meetings held between July 2013 and April 2016 where presentations regarding the nine items listed below were considered. Environmental Stewardship provided a number of documents and presentations to the District Representatives and their consultants, ES commented on the items for consideration listed below, describing specific concerns, requesting additional information and actions, and making recommendations. These documents, along with the presentation, are available on the GMA-12 website and are also on this website (see ES comments on GMA-12 Proposed DFCs). Following adoption of proposed desired future conditions (DFCs) the GMA-12 Districts are required to provide “a period of not less than 90 days for public comments” Proposed DFCs were adopted by resolution the GMA-12 at its April 15, 2016 meeting. 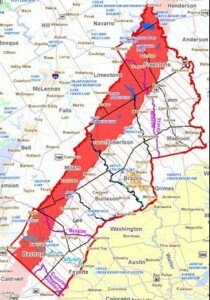 “After the public hearing the district shall compile for consideration at the next joint planning meeting a summary of relevant comments received, any suggested revisions to the proposed desired future conditions, and the basis for revisions.” The Districts are then required to prepare an “explanatory report for the management area and submit to the development board (TWDB) and each district in the management area. (5) discuss reasons why recommendations made by advisory committees and relevant public comments received by the districts were or were not incorporated into the desired future conditions. Environmental Stewardship provided comments to Lost Pines Groundwater Conservation District (both oral and written) on May 20, 2017. As required by the Texas Water Code, these comments are to be considered and responded to as described above according to the Texas Water Code. ES comments to GMA-12 and Lost Pines GCD on Proposed DFCs). To avoid Environmental Stewardship’s comments to the GMA-12 representatives between the start of the review in 2013 and the end of the review in 2016 (excluding final summary comments to the Lost Pines GCD in 2016, GMA-12 decided that the review process only included the final summary comments and summarily ignored all of Environmental Stewardship’ comments during the 4 year review period … a questionable judgement on what the law requires.